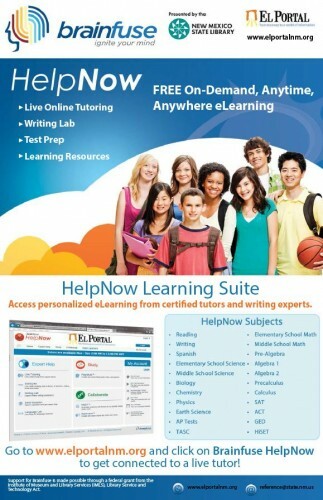 Now that our library patrons have access to Brainfuse HelpNow and JobNow, it’s important that we get the word out! We want everyone in New Mexico to know that they have homework help, test prep, and career assistance at their fingertips through your library’s website. Currently, the State Library has marketing collateral from Brainfuse that publicizes the program’s placement on our El Portal website. Below are links to these flyers, bookmarks, and brochures that you can download and print out for use at your own library. However, if you would like these types of materials customized with your library’s name and website, please contact Elize Aunahn at Brainfuse, and she can set you up with custom materials.